Quick instructions for adding a Book Now button to your business's Facebook page. Fans and clients of your business can book appointments right from your Facebook Page. All you have to do is add a Book Now button, which takes just a few quick steps. 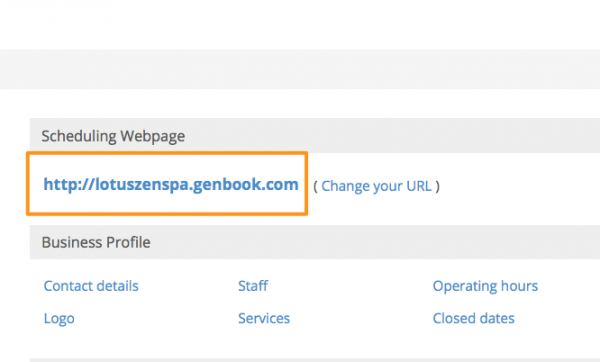 First, locate and copy your Scheduling Webage URL from the top of your Genbook Settings page. Next, on your Facebook Business Page (not your personal profile), Click the blue "+ Add a Button" button. Select the top "Book with you" option, then choose "Book Now" as the button text. On the next screen, choose the "Link to Website" option. Paste the scheduling page URL you copied from Genbook and click "Save" at the bottom right. Finally, Facebook asks you to look over your configuration and complete the process. Double-check that the button type and URL are both correct, then hit the "Finish" button. The "Book Now" button will then show up on your business's Facebook Page on both mobile and desktop browsers, and in the Facebook app, so your clients can easily book no matter how they connect with your business on Facebook.